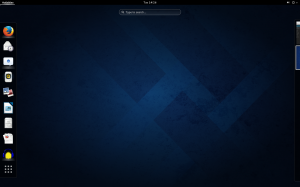 Tech Tuesday: Fedora 20 Screenshot and a Video! GNOME Shell in all its glory. First off, for those who missed it, here’s the latest episode of our podcast. 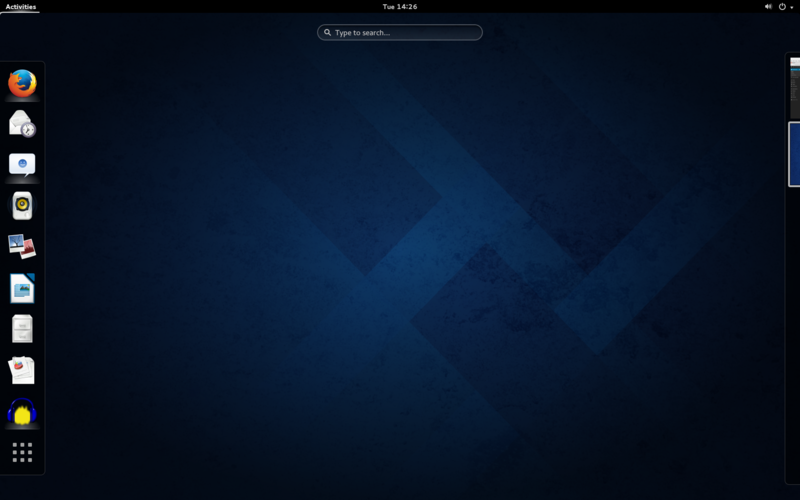 I’ve set up Fedora 20 on the HP Elite 410y Desktop, and it works so far. Seeing as how it contains LibreOffice, I should be able to work with some documents while running this OS for about a month. One of the things I’ve been wanting to do for some time is get down to the nitty gritty in terms of installation and how well the system works. I don’t have a system that’s portable with NVIDIA graphics, because the Toshiba Tecra M9’s GPU is problematic (it hangs on the latest binary drivers). Due in part to Bruce Byfield’s observations about distro reviews not quite having enough details (i.e. how smooth the installation is, etc… etc…), I figured I’d take a bit more time in terms of installation. I’ve taken a few notes and made a few observations about some of the quirks of installing Fedora 20 from a Live DVD. The Reglue Project helps kids acquire a computer for school in Texas when their parents can’t afford one. We send said Geek a reconditioned laptop with Linux on it and they locate a school-aged child in their community that wouldn’t normally be able to afford a computer in the household. Deliver the computer and spend some time showing the parents and the child how to use it, and support them when they need help. Yeah, I know…that’s asking a lot. But 12 of you did it. Richard Kapler is credited as one of those geeks who gave a computer to a child who is doing everything they can to make it into college. There are currently plans to tell the story of more of these geeks. Well done, helios. Well done. I remember growing up with the NES. It was the predominant gaming console of the late 1980’s. That’s why it could be found in Children’s Mercy Hospital in Kansas City. Though I didn’t own one, I’ve also played the Sega Genesis and found it to be fascinating. This 16-bit console hit North America before the SNES, making it among the first of the 16-bit systems. Sonic, Mortal Kombat, and other games that had more of adult elements (in some cases, via cheat codes) were possible under the Genesis. However, friendly games like Ecco the Dolphin were also available for enjoyment. Sporting a Motorola 68000 CPU, this console ran off the same architecture as old school Apple computers. Though it never really took off, the company eventually released add-ons to increase the capabilities of the Genesis. Though they never quite made it in the console market, Sega can still be found today publishing popular games for numerous platforms. Thank you Sega for re-igniting my passion for vintage gaming. Out with 2013, and in with 2014. No matter what this year brings, it won’t be boring. With that said, here’s some links for you to check out this week. Getting Involved in FOSS (opensource.com): The Red Hat sponsored website has seven ways for people to get involved in various projects that share their source code and invite collaboration from others. For those who can’t code their way out of a paper bag, there’s always writing documentation and creating digital art for the various projects, because good instructions and pretty icons can go a long way in making an application more attractive. Exciting Changes to 5.0 of the Phoronix Test Suite GUI (phoronix.com): Though it was initially written in GTK2, HTML 5 is being used instead. According to Michael Larabel, “This new GUI to Phoronix Test Suite 5.0 is being written as an HTML5 interface. This is being done for portability and network transparency with the Phoronix Test Suite commonly being used on embedded devices and servers where there is no connected devices — remote support for PTS 5.0 HTML5 GUI can be enabled, otherwise it’s only exposed locally.” Work on the interface is currently ongoing. Now It’s Our Turn (Blog of helios): Ken “helios” Starks has been through quite a bit over the years. He decided to tell the story of how he is now able to give back to those who have helped him, starting with Randy Noseworthy. It looks like the Reglue Project will be able to help bridge the digital divide more than ever. District Judge Rules in Favor of Warrantless Border Searches (Maximum PC): The controversy continues over warrantless border searches as a Federal Judge declared that risk of seizure was insignificant, so plaintiffs have no standing. It looks like it’s time to learn how to use encryption or data wiping techniques before traveling to other countries. Horrible Things Done to Male Sexual Organs (deadspin.com): In weird news, males have apparently hurt themselves in the no no parts in 2013. Some of these entries will make you laugh, others will make you cry, and the rest will make you hurt down there. 14 Million Doses of Potassium Iodide Ordered (infowars.com): The stuff that prevents radioactive iodine from being absorbed by the thyroid is apparently being ordered in an unprecedented quantity, according to this. It is apparently related to the problematic Fukushima reactor. U.S. Sailors have apparently come back sick after helping out in the area, and have sued the Tokyo Electric Power Company (TEPCO). This tidbit may crop up again this year.